This guide provides instructions and videos to learn more. 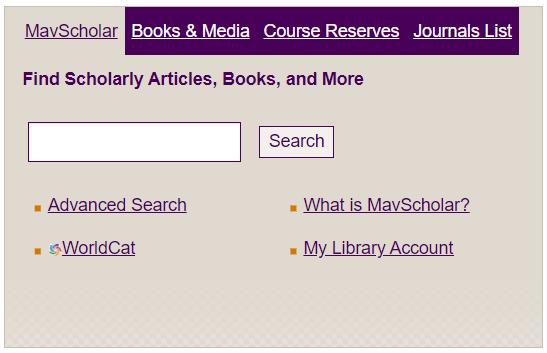 MavScholar is a simple way to search for articles and books at the same time, across all subjects. Start with MavScholar when you are beginning your research, doing interdisciplinary searching, or looking for a specific book or article by title. This playlist contains two videos, an introduction to MavScholar and then a short demonstration of the tool's search features. What if I can't find relevant results? You may have better luck searching one of the disciplinary databases. As always, reference librarians are happy to help you if you're not finding what you need.